Cross-platform software to maximize your online advertising. Hear what makes us great -- straight from our customers. Analyze & improve your digital marketing -- for free! Search Marketing is a tactic used to gain online presence and traffic via paid and unpaid strategies on search engines such as Google, Bing, and Yahoo. Visualize the last time you searched for something whether that be on Google, Yahoo, or Bing. The text you typed into that small search box is called your “search query,” which then directs you to a page similar to the image below. This page is known as a SERP or Search Engine Results Page. Various studies have found that the higher you are on the SERPS the more likely you are to gain traffic to your website. But the question is how does Google determine who gets these top placements? This is where search marketing comes into play. SEO (Search Engine Optimization): Gaining search engine listings via unpaid tactics. PPC (Pay-per-click or paid advertising): Gaining search engine listings via paid tactics. Why Is Search Marketing Important? The answer is simple. Every day millions upon millions of individuals hop on the internet to search, whether that be for a new restaurant, a problem they’re trying to solve, or a product they’re looking to purchase. Wouldn’t you like your business to appear in the search results to provide them with the solution they’re searching for? This is why search marketing is a critical strategy for all businesses who want to gain and grow their companies. Now that we know search marketing is critical for business growth, let’s dive the two tactics that can improve your presence on search engines. As we went over above, this is the process of gaining presence via unpaid efforts. The ads that appear on the SERPS that are unpaid are known as organic results, which are found below the paid search ads. See the image below – the ads which are organic are the ones found in the green box below the top paid placements highlighted in blue. Search engines like Google find organic listings by crawling the internet with spiders that review the text on your website, PDFs, documents, and other content. Google also considers the data in your website’s source code called meta tags, and whether other sites are linking directly to your website. For Google the goal is always to provide the best results possible so if people aren’t clicking on your site from the SERP or if they are determined to have a bad experience Google will update its algorithms to focus on higher quality fits for a query. How do I increase my chances of getting listed organically on Google? This is where SEO comes into play. There are several things you can do such as improve your chances of being ranked organically such as rewriting content to match keywords, write meta tags to match keywords, create more quality content to build authority, get other sites to link to your site, and maintain an active presence on social media to help create external links. Paid search gives you a much higher level of control when it comes to the searcher’s ability to find your website on the SERPs. With paid search advertisers tell Google for which search terms they want their ads to show. Google then shows their ads and takes their money when someone clicks on their advertisement and is directed to their website (hence pay per click). Advertisers do not pay to show ads for keywords, but they do pay when searchers click on them; the amount you pay is called cost-per-click (CPC). How does Paid Search work? Advertisers first need to create a Google AdWords account (and/or a Bing account). Then they’ll need to decide which types of search terms they want their ads to show for by creating keywords. Each keyword has a max CPC assigned to it, which is decided by the advertiser (NOTE: the max CPC is not the number that the advertiser will necessarily be charged, but rather a threshold that the cost should not exceed). This allows advertisers to bid higher on keywords that may be worth more to them. A set of keywords needs to grouped (into an ad group) to direct the user to a specific advertisement and landing page. Google auctions off ad space to advertisers in the Google AdWords auction. During the auction Google ranks advertisers based off of their ad rank, which is determined by their bids and their quality scores. Each auction is different so for one search an advertiser could be in position one on the SERPS and another search the advertiser could fall to position three or four. In order to understand how ad position on the SERPS is determined it’s important to gain a thorough understanding of how the Google AdWords auction works. How do I get started with paid search marketing? Before setting up and running a paid search campaign it’s critical to learn and comprehend the ins and outs of paid search. Luckily, we’ve create PPC University to guide you through the terrains of PPC. Your paid search campaigns require continuous care and maintenance which can also be exhaustingly time consuming and confusing. This is why we’ve created WordStream’s PPC Advisor to help you identify weekly optimizations, areas where you may be wasting spend, and opportunities to grow your account and business. WordStream users get 60% more leads from search marketing than AdWords users alone. Already have a paid search marketing account? 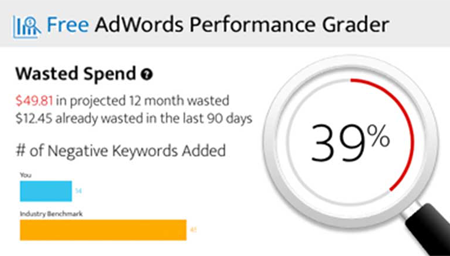 Figure out how you’re doing in PPC with our free AdWords and Bing Graders. Our software and services help businesses and agencies take the guesswork out of pay-per-click advertising so you get more from your marketing budget. Find out if you're making mistakes in AdWords. How Much Does AdWords Cost? © WordStream. All Rights Reserved.